As well as helping research and innovation organisations, we’ve also been their client on a number of occasions — and have received a number of generous invitations to end of project celebrations. We can’t help noticing how much effort is invested in engaging people like us who already know about their work. With funding for research proposals increasingly dependent on a strategic and costed communications plan, it’s important that staff have the expertise to tell a good story that engages people at a human level — with the promise of a better future, one hopes. We’ve become interested in how research organisations are using innovative ways to engage a different public. Would you have thought of taking your researchers to setup stall at the local fun-fair, like Birmingham University? 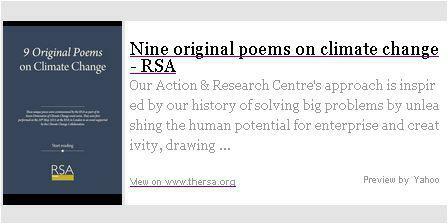 Britain’s RSA ran a poetry marathon to try to close the gap between cognition and action on climate science. Have a read — and reflect on how it engages you. What might you do with your research to engage a wider audience?